I wanted to share a card on Monday.. I hardly ever do that! lol But I just love this adorable Hugs stamp set from Concord & 9th! For the background, I sponged a 5" x 3 3/4" piece of 80# Neenah Classic Solar White cardstock with Tim Holtz Broken China distress ink leaving it darker around the edges. I lightly spritzed the paper after ink blending and dabbed it with a paper towel. I cut my Taylored Expressions clouds out and attached them with Tombow Multipurpose adhesive. I added a piece of Garden Green cardstock that was cut with the Lawn Fawn Grassy Border die. I sponged the edges just a bit prior to adhering it to the front panel. Next I added my Bear that had been stamped on Kraft Cardstock using MFT Black Hybrid Ink. I used a little Vintage Photo Distress Ink and an Aqua Painter to darken his nose. I stamped the sign portion on white cardstock and used Antique Linen Distress Ink to paint the sign. I fussy cut everything and attached with fast fuse to the background. 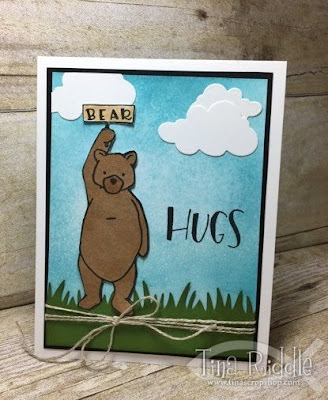 I stamped the "Hugs" sentiment with MFT Black Hybrid Ink.using my Misti so I got a nice dark impression. Finally I added some loops of Natural Twine and tied it in the front and then attached this layer to a Basic Black mat that measured 5 1/8" x 3 7/8". I attached that to a 11" x 4 1/4" White top folding card base of 110# Neenah Classic Solar White Cardstock that was scored at 5 1/2". Although I know my fussy cutting is not the best, this is still a totally cute card! I can't wait to send it to someone! OSAT Blog Hop - All You Need is Love! PCC229 Sketch Challenge - Lucky Dog!